SHamp is a compact amplifier that fits into the sound hole of your acoustic guitar. A cable connects SHamp to your pickup jack. 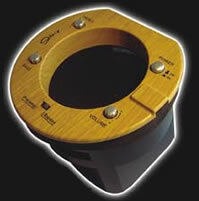 SHamp gives your music “punch” that is missing in acoustic environments. Easily installed, SHamp produces enough power to give your performance the presence it deserves. SHamp features a specially-designed speaker and 4 watt amplifier that fits neatly into the sound hole. SHamp is powered by a strap/belt mounted 18 volt battery pack that is attached to SHamp via the SHamp input. You’ll get up to 6 hours of continuous playing on a single set of good quality alkaline batteries! 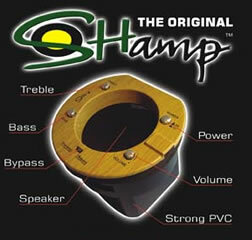 SHamp does not interfere with your guitar's natural sound. It’s designed to let the sound flow around the speaker. Unique compact pre-amp system fits neatly into the sound hole. Installs in a few minutes - no modifications to your guitar required. Unrestricted mobility, goes anywhere - includes battery pack. Suitable for students, buskers and professionals - be heard! SHamp will not damage your instrument and is easily removed. SHamp does not need to be removed when using external amp. SHamp fits sound holes 96mm (3¾ inches) - 102mm (4 inches). SHamp can also be used with external effects processors.